What is a Natural Cleaner or Natural home care product ? The use of the term “Natural” to describe a household cleaning product or personal care item does not mean much, while the term “Organic” is closely regulated. Whole Foods Nature’s Power Laundry detergent includes the ingredient SLS (Sodium Laureth Sulfate) and has been called an eco friendly household cleaning product. This chemical is used in many cleaning products and can be made from coconut oil, palm oil, or petroleum. How natural is this? A plant based version is more green, but it is still the same chemical compound. SLS is a major concern because the creation process generates trace amounts of 1,4-dioxane, a carcinogen. There are no guidelines currently for using Natural in a product description, hence it is being overused all over the place as it does help Sell products. Most companies claim a product to be Natural if the ingredient came from nature. Not everything from nature is safe. How many poisons exist in nature? A ton. are all meaningless, but help Sell items. Companies can charge a premium for these household and personal care products. Parents was less harmless products. Consumers want less damaging items. No law exists that forces manufacturers to disclose all their ingredients to consumers. It charges over 127% more for the Natural Mrs Meyer version. What is a Natural Cleaning Product? What is exactly a Natural Cleaner or Natural home care product ? There had been no standards setup in the home cleaning products area but now the Natural Products Association (NPA) is now extending its natural seal and standard to include home care products, such as household cleaners, laundry detergents, concentrated and ready-to-use hard surface cleaners. In May 2008, the Natural Products Association established a standard and seal for natural personal care products, such as lotions, balms and shampoos. To date, more than 340 products have currently been approved and certified. WSJ has a good article that covers the green washing that is going on with all these green bugs and logos on products. Many logos mean virtually nothing. These 15 green-label programs are recognized as good benchmarks by experts and retailers such as Green Depot and Office Depot. According to a study, 95% of consumer products committed at least 1 offense of “greenwashing” or displaying unproven environmental claims. The word green or eco friendly can and does help sell products. It is time to examine terminology closer. Greener Choices has a good Eco-labels center that helps you decipher what green product claims really mean. Some interesting facts. This little marketing logos or bugs work to make products look more legit. Meat labeled as “natural” can contain artificial ingredients, and Natural does mean anything unless it pertains to meat and poultry where it means minimally processed with no artificial flavor, coloring, or chemical preservatives. “Natural” turkey can have diets that include hormones, anti-biotics, or genetically modified corn. Simple Green says it is nontoxic but it contains 2-butoxyethanol that has been linked to reduced fertility in mice. Terrachoice covers the six sins of Greenwashing: Hidden Trade-off, No Proof, Vagueness, Irrelevance, Fibbing, Lesser of Two Evils. FTC has a guide to various green terms. “William Nazaroff, a professor of environmental engineering and chairman of the Energy and Resources Group at UC Berkeley, said the EPA erred when it removed the chemical from the hazardous air pollutants list. Nazaroff conducted a study for the California Air Resources Board in 2006 on the indoor air chemistry of cleaning agents and toxic air contaminants. A quick look at the Simply Green Material Safety Data Sheet (MSDS) shows the 2-butoxyethanol ingredient. It also has <1.2% VOCs. Far from a product that is all natural. Furthermore, the Simply Green bottle does not even list all ingredients. Here are some tips for making eco friendly and really cheap homemade natural cleaning products. 1) Baking soda cleans but also gets rid of odors. (That is why we use it in the frig) Sprinkle on the carpet and vacuum it up. Mix it with Sea salt and it is a good scouring cleanser. 2) Vinegar removes grease and dirt. White vinegar gets rid of carpet odors. Vinegar, baking soda, and water can make a good all purpose cleaner. 3) Citrus juice and peels like that of lemon are good for freshening up rooms. 4) Borax (20 Mule team) cleans, removes stains and disinfects. A good bleach alternative. Cleaning shower head holes is a pain. No need to use harsh poisonous chemicals. An easy way to do it is by unplug the shower head and soak in a mix of equal parts of white vinegar and warm water for about 2 hours. Rinse it off. 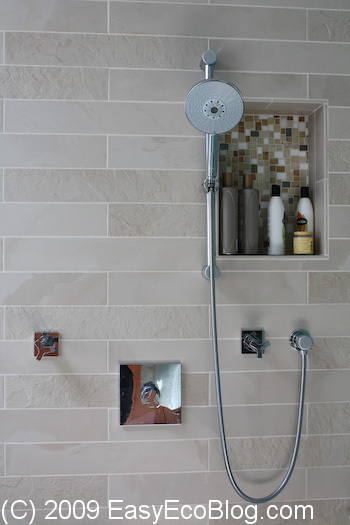 A mix of 2 tablespoons of white vinegar with 1 quart of warm water works well on bathroom tile. Be sure to use a soft towel and rinse it off afterward. Eco friendly green cleaning windows is easy. No need for harsh and expensive chemicals. Half cup of cornstarch with a gallon of warm water will make you a very good cleaning solution. Rinse with a touch of white vinegar mixed in with water and then wipe again. Crumple and reuse old newspapers to wipe instead of using new paper towels. Have you bought a product because it had Natural on the label? Home made cleaning products are great as they do not cause any harm to hands. Synthetic cleaning products are very harmful for health.Harrow Weald Carpet Cleaners Ltd.